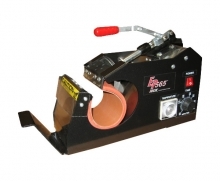 Side mount loader perfect for tall mugs and cylindrical objects. Great for Sublimation and Laser Transfers. Auto-reset timer that can be set up to 6 minutes. Generates firm even pressure for perfect image transfer every time. Easy to use open/close handle with adjustable pressure. Maximum image area 7 1/4" x 3 3/4". Flexible heating element for irregular shaped mugs. With an updated closure system for increased pressure and a new look, the HIX EP-565 mug press is still the most durable mug press on the market. 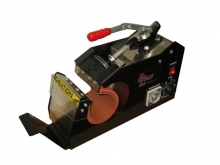 The EP-565 is a side load mug press, perfect for tall mugs and longer cylindrical objects. The new design, with easy-to-use longer handle, generates firm even pressure for a perfect transfer every time with maximum image size of 7-1/4" x 3-3/4". 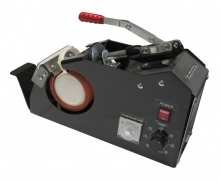 The EP-565 is equipped with a flexible heating element that easily conforms to irregularities in ceramic mugs, reducing the amount of rejects due to uneven heating and pressure typical of other mug presses with more rigid elements. Produce bright, beautiful images on all sizes of mugs and steins; some in as little as 4 minutes.